The blind can see, the deaf can hear, and the paralyzed can walk—without a doubt, the Golden Age of Neuroscience is upon us. And if that weren’t enough, mind control, telepathy and in fact elaborate real-life Avatar scenarios are so nigh that scores of the neurotech-savvy have begun to pre-order their titanium thought defense helmets. So awesome have the leaps of neurotechnology been in recent years that the media has struggled to deliver this industry a deserved timely coverage, and public awareness has just barely caught up with humanity’s neuro-prowess of late. And what came about was the usual by-product of a much-too-quickly advancing technology: terminology fails. On April 2, 2013 President Barack Obama unveiled the BRAIN (Brain Research through Advancing Innovative Neurotechnologies) initiative, whose final and uttermost objective is to visualize, map, understand and reconstruct the activity of every single neuron in the brain. This knowledge will in the future be applied to the development of new technologies and the treatment of quickly expanding array of neurological disorders. BRAIN’s near-sighted primary goal will be to sponsor ongoing brain mapping projects, such as the Human Connectome Project, which the initiative claims will help us visualize every neuron in the brain and understand the formation of synapnses (connections) between neurons in live brain tissues. As the Human Connectome Project deals primarily with brain scans of live humans and their brains, this happens to be a feat which, for the time being, any knowledgeable neuroscientists will tell you is utter nonsense. The Human Connectome Project (HCP) has been dubbed one of the greatest neuroscience ambitions of the new millennium, much akin to the Human Genome Project a decade ago. The project showcases efforts to fathom the complex macrocosm which unites every axon bundle in the brain with the use of high-resolution fMRI or other non-invasive techniques, and symbolizes the positive level of trust which neuroscientists now assign to neurotechnology. HCP precedes and perhaps supersedes the BRAIN initiative, as already in 2010 it secured grants collectively worth over $40 million from the NIH. 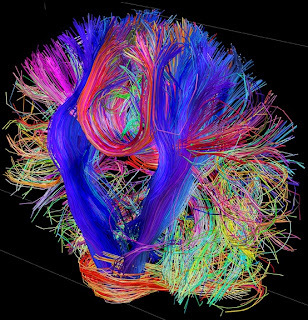 Initial 1200 Connectome subjects will be scanned for hours using an fMRI scanner 4 to 8 times as powerful as a standard one, utilizing the power of one nuclear submarine per scan, in hopes to yield insight into the connectivity of nerves within a brain, and how this connectivity varies throughout species and in disease. With novel neuro-terminology threatening to become its own language, much confusion and mis-representation surrounds HCP, and naturally the media hype it triggered has seemingly gotten lost in translation –or, rather, in literary terms. 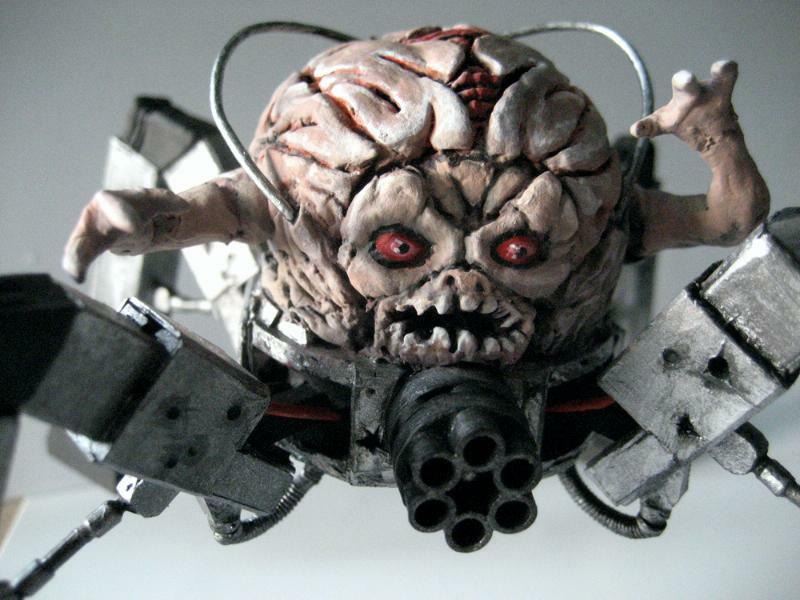 In bold truth, the techniques which the HCP is set to exploit are entirely non-invasive brain scans whose resolution is equivalent to that of a rusty security camera. Although general brain regions of humans will be clearly visible, local inter-region synapses, which form 80% of connections in the cerebral cortex, are entirely inaccessible to supracranial scans, as even a light microscope of the highest magnification is insufficient to visualize a single neuron. In other words, an fMRI scanner does not, and probably never will, visualize single cells and local synapses in the brain. 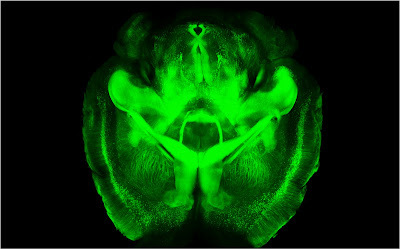 However, HCP may yield great insights into the "connective visuality" of the brain, as vibrant HCP images (such as the one below) show thousands of connections between particular brain regions via axonal bundles (which are cables composed of many nerve cells, a bit like your landline telephone wire, not single brain cells). Scientists say that it is this inter-region connectivity which is responsible for our superior intelligence to other species, as preliminary scans clearly show a much more "connected" human brain in comparison with that of a chimpanzee, for instance. Scientists also believe that comparing such deep brain scan images between healthy and ailed individuals can help us understand neurological disease in the future. Does this imply that we shall never be able to dwell into the microscopic ecosystem of grey matter? Not at all, although it may take some time until we are able to do so in humans. Non-human species, however can now be studied with a dozen of other, much more invasive techniques you probably wouldn't want performed on yourself. These techniques' findings collectively contribute to the general brain Connectome (note the unnecessary similarity to the Human Connectome Project) across all species-which is, in essence, a brain equivalent of the genome. To make matters more ponderous, Connectomics is the study of the connectome with all the research techniques available today, comprising MRI, electron microscopy, fluorescent cell staining, rendering brains see-through and a fantastical endeavor which goes by the name of optogenetics. One rather straight-forward technique used to visualize individual neurons and synapses in the cortical column is, literally, brain carving. A team of researchers at Harvard, led by prominent brain explorer Dr. Lichtman, have been working towards creating the most efficient contraption for slicing off pastrami-thin slices of mouse brain and observing them under a powerful electron microscope. Theoretically, this process may yield a complete 3D cellular reconstruction of a brain, but it would require creating and aligning thousands, if not millions, of brain slices. 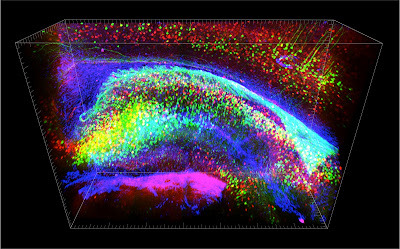 Amongst other, less brute-force neuronal visualization technique is the Clarity Project, which helps visualize neurons in brains of live mice. The Clarity project revolves around scientists' ability to chemically produce completely transparent brains (or other organs) in mice--a technique which was recently developed by Prof Karl Deisseroth and his team at Stanford. The chemical treatment strips away lipids which normally block the passage of light using the detergent SDS. But perhaps the most compelling technique developed at Deisseroth's lab is optogenetics - a research tool which revolves around a gene discovered in 2002, encoding light-gated ion channels, or Channelrhodopsins, found in unicellular green algae. Upon activation with a specific-frequency light, the channels open, causing an ion influx into the cell much akin to the mechanism which causes our neurons to fire. 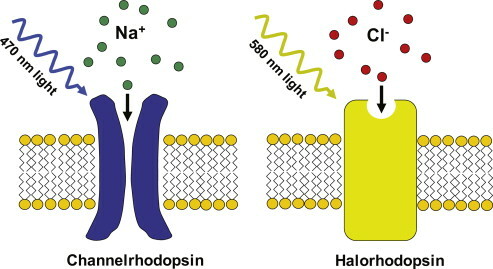 Using a different light frequency can also activate a different set of channels—the Halorhodopsins which will cause a negative ion influx into the cell and thus inhibition of the neuron. For algae, this mechanism’s function is to orient the cells towards or away from light. But this mechanism can also be applied to mammalian cells. In recent years scientists succeeded in engineering rhodopsins from algae into nerve cells of mice, either grown externally or, in fact, in perfectly alive animals. In essence, genes encoding these channels can be “injected” into very specific areas of the brain, which will render those areas light-sensitive. By shining a light with the use of optic cables into those areas, scientists can trigger very specific neurons, and examine the animal’s behavior, thereby demonstrating the role of the specific neurons they are studying. Click here for a video of an optogenetically-challenged mouse commanded by scientists to go in perpetual circles. Ultimately, all the techniques which have armed neuroscience in recent years work towards one ambitious goal: to comptuationally simulate the workings of a brain, which would give us the ability to re-create, and perform "virtual healing", on neurological ailments. A breakthrough milestone was achieved in this sphere of connectomics in 2012: scientists were able to unveil key principles which guide the formation of neuronal interceptions, and applied these principles to a computational structural prediction model. In this way they were able to demonstrate that brain neurons grow independently of each other, and form connections once they intercept each other’s paths in the brain. Some might argue that virtually recreating a self-sufficient human brain capable of conscious thought like you and I might not be a great idea, but that's for later debates (we are not there yet).